Sit back and let the D2D team produce a Zemix event on your behalf for the community, contribute to an existing community event or let us produce a corporate wellness event for your employees. Choose from group NSEV Healing Acupuncture, Tai Chi, Integrative Yoga, Budokon Yoga (Martial Arts Yoga), Laughter Yoga, SUP Yoga, Guided Meditation, Energy Medicine, Integrative Pilates, Breath Work, and more. Incorporate into your event our signature Sound Healing Headsets, a live musical performance, spiritual dj, etc. The options are endless. Follow your contribution to help educate and heal the community through our social media outlets. 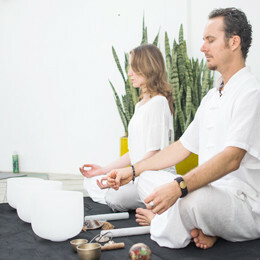 Work with top Energy Healers and and Meditation experts in South Florida. Collaborate with the only South Florida team of NSEV Healing Acupuncture Physicians. Enhance all activities with our signature Sound Healing Headsets, streaming live music by our Spiritual DJ or from live musical performances. Choose from our team of experts in Vinyasa, Jivamukti, Budokon, Laughter yoga and every style in between. 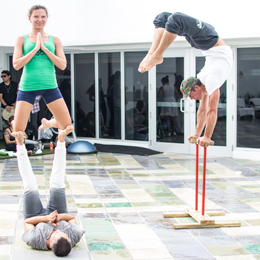 Mix together different yoga activities for the event. Add acro yoga activities to engage the younger audience. At Dare2Detox, we are committed and passionate about making a positive social impact and strive to educate the community about prevention through holistic health care. The Dare2Detox’s wellness event production platform was primarily launched to advocate for mental health prevention through progressive holistic health care programming such as NSEV Group Acupuncture for community outreach and corporate wellness. 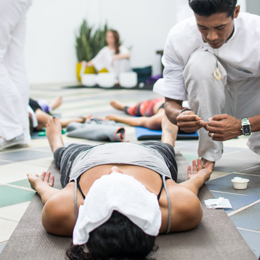 With our dedicated team of volunteers, our generous Zen Ambassadors help sponsor all of our community events in order to provide complimentary group holistic health care based programs to the public in a dynamic and engaging manner. From specialized integrative programming for corporate wellness such as group NSEV Healing Acupuncture with Meditation or Yoga to a family community event with Tai Chi, Meditation, Budokon Yoga, Laughter Yoga and Acro yoga activities with our spiritual DJ, the Dare2Detox team and our Zen Ambassadors are committed to sharing our services to the community and welcome everyone with us on this journey to complete wellness!